The Origin: Rocketed from the dying planet Krypton, a lone baby lands in a Smallville Kansas field. Adopted by Martha and Jonathan Kent, the infant is raised like any other child, but the Kents soon learn their adopted son Clark is anything but ordinary. Under the Earth's yellow sun, he's developed powers and abilities far beyond those of mortal men. The Character: It's six years removed from the world of TV's "Smallville," where Clark, Lex Luthor and Lana Lang all grew up together as friends. Clark's just graduated from university and has been offered an entry level job at the Daily Planet. Supporting Cast: Lana is still Clark's girlfriend, but their long distance relationship is strained as Clark grows closer to fellow Planet reporter Lois Lane. Lois, a tenacious and clever reporter, is also the protégé of Planet senior writer Perry White, the man who mentors Lois and Clark in both their work and their personal lives. And just as Clark settles in Metropolis, billionaire industrialist Lex Luthor re-emerges after a four year disappearence from public life. 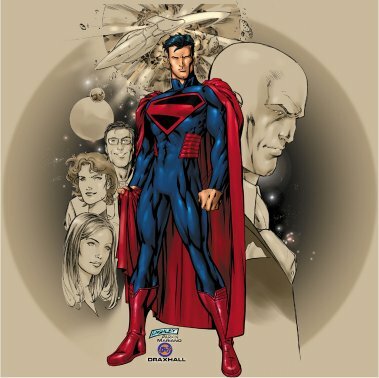 The Set Up: After learning to control and master his powers while growing up in Smallville, Clark Kent moves to Metropolis and dons a costume to help protect the world as Superman.